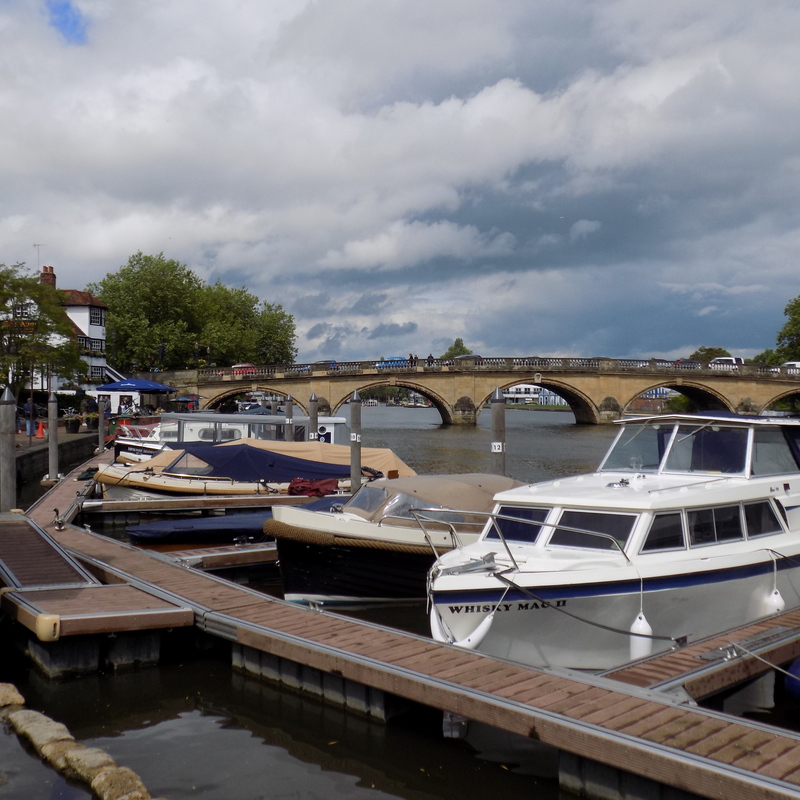 On a balmy warm mid-summer’s day in June, I found myself in the riverside market town of Henley-on-Thames. My husband has a business here so I have an even better excuse to visit this beautiful South Oxfordshire town. 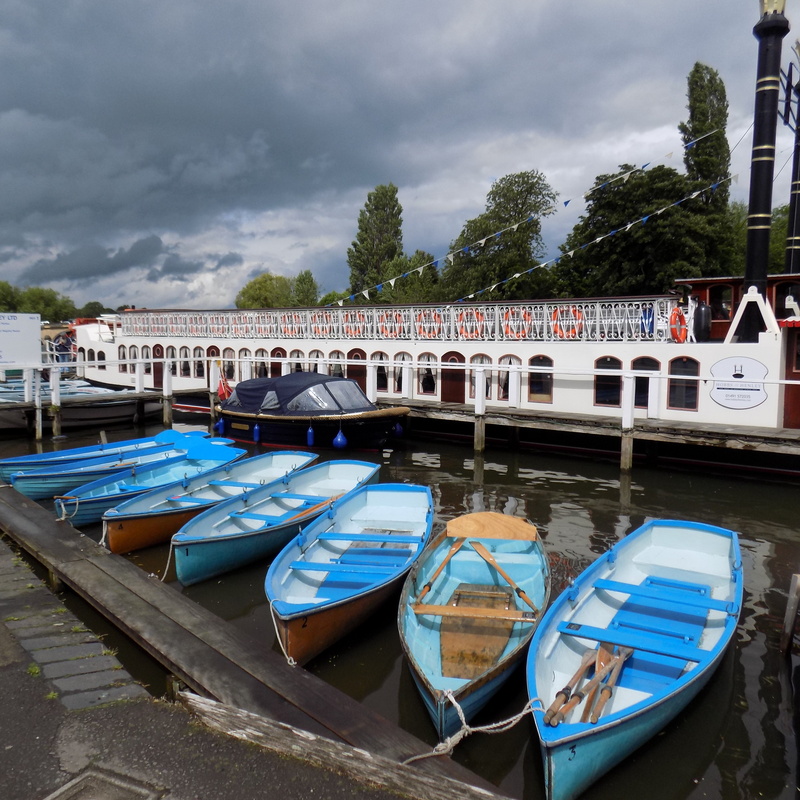 With Henley Royal Regatta just around the corner, the familiar striped blue and white huts dotted on the edge of the river appear and the town has an exciting buzz about it not to mention some handsome young men walking around, rippling muscles almost bursting the seams of their bicycle shorts, they’re definitely pleasing to the eye! 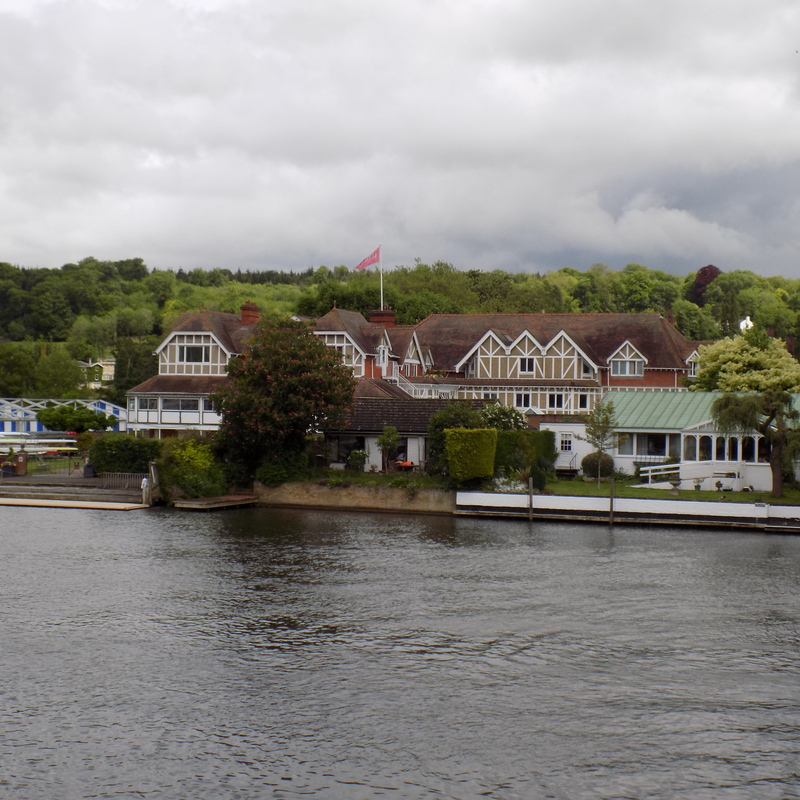 Oh yes, back to my visit to Henley. 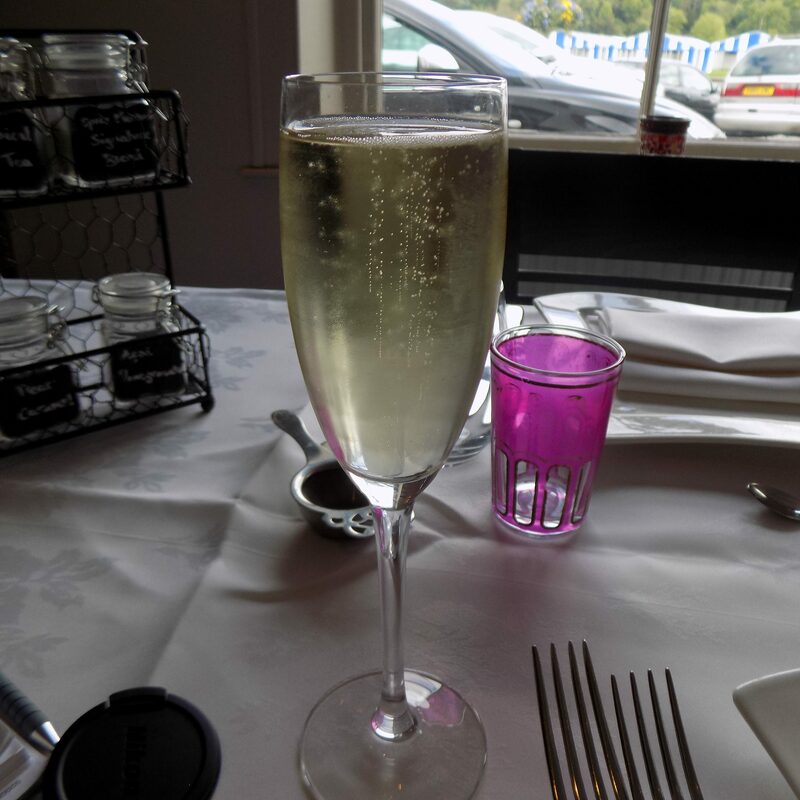 With so much to do in Henley, I was tempted just to wander off and take in the relaxing ambience of this picturesque town but I decided to leave that to another day because I was here to visit one of the town’s Indian restaurants for Afternoon Tea with a Twist. 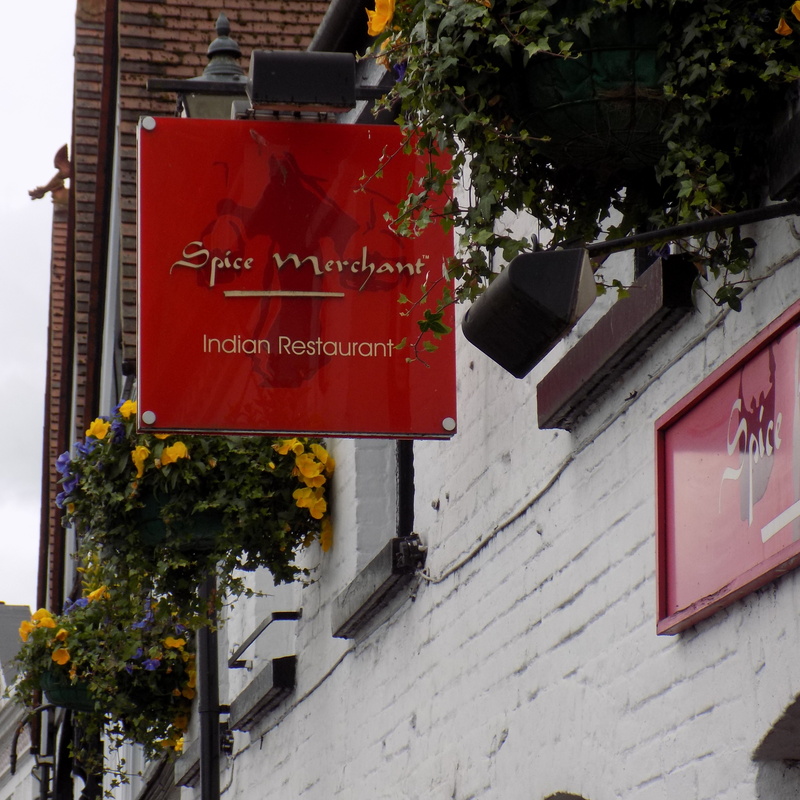 The Spice Merchant has long established itself as Henley’s finest restaurants for Indian cuisine with branches in Beaconsfield and Cookham, the group was founded in 1982 and has obviously come a long way since then. Henley branch sits right by the river and so enjoys a stunning view, it makes for a really romantic setting as dusk falls with the river twinkling under the fairy lights that adorn Henley’s mature trees, you could be forgiven for thinking it’s Christmas. Offering an adventurous mix of traditional and creative contemporary Indian cuisine, The Spice Merchant fuses together unusual spices hitting the balance of heat and warmth just perfectly and having eaten here several times before I was both curious and excited to try their take on the traditional much loved British ritual of Afternoon Tea. This is a new concept recently introduced at the Spice Merchant which offers an alternative to what is commonly quite rich and starchy Indian cuisine and is a clever way to fill the restaurants’ usually quieter post lunch time lull. 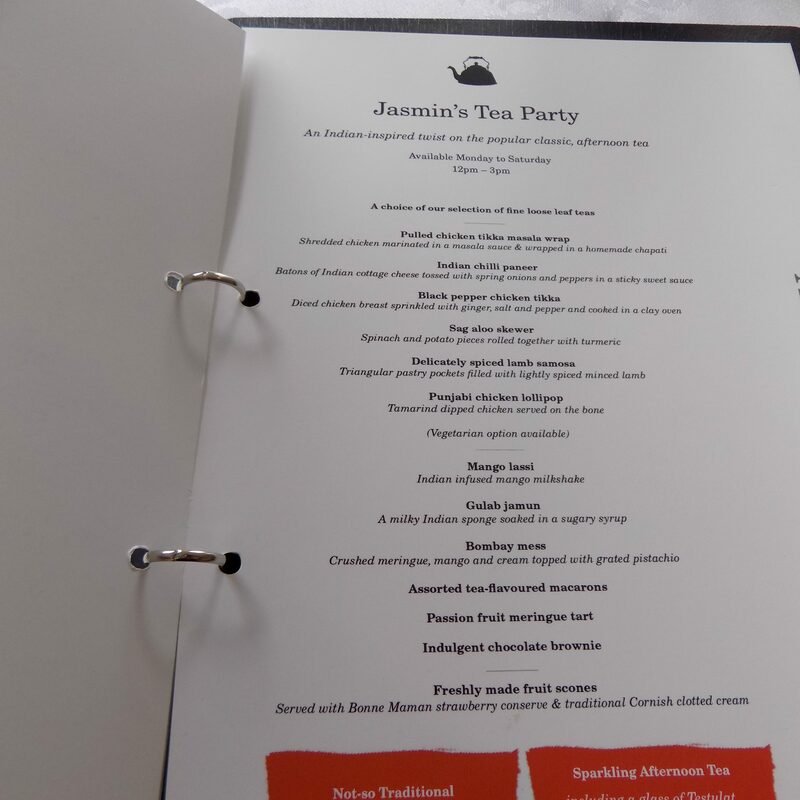 Their ingenious and imaginative naming of their Afternoon Tea “Jasmin’s Tea Party” evokes magic carpets, dark haired Princesses and mysterious Arabian nights, I wonder if Jasmin’s Tea Party was going to be a culinary mystery too? I was greeted with a very welcome glass of zingy champagne which is always a delight followed by an array of tea in cute miniature jars. I’m really not a tea connoisseur and rather clueless on the subject so I went for my usual if perhaps boring but very flavoursome English Breakfast tea. 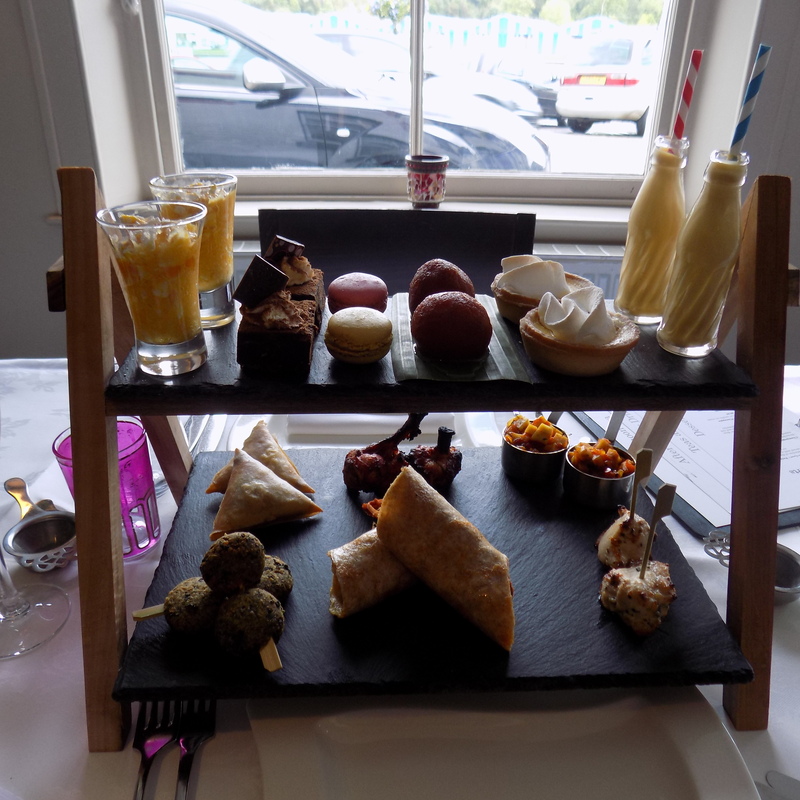 Soon I was presented with a really lovely looking double slate tier taking on the form of the traditional tiered Afternoon Tea stands full of delicious Indian sweet and savoury treats. 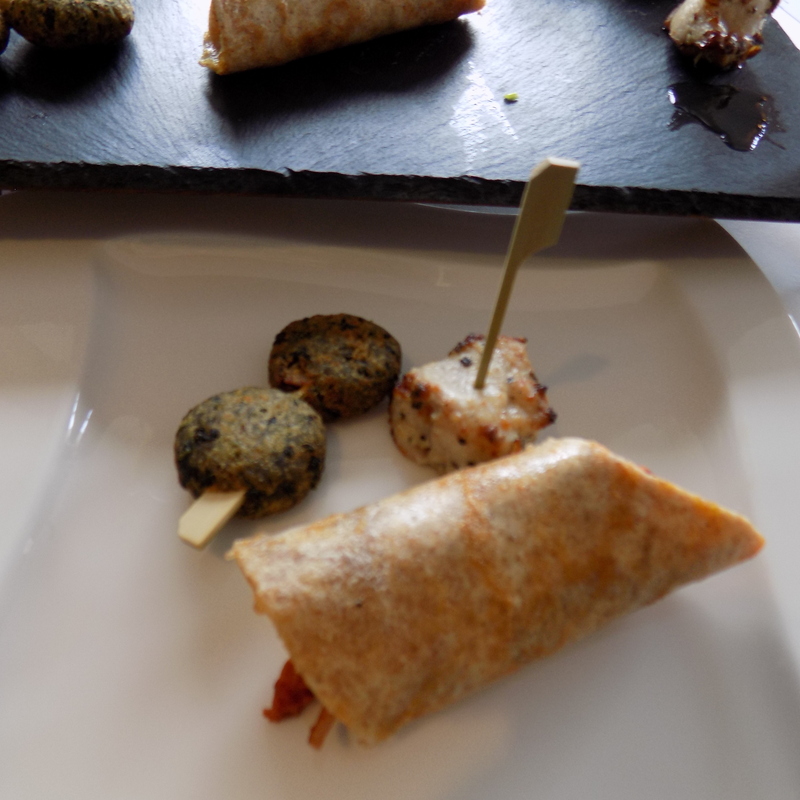 The savoury bottom slate was full of appetizing bite sized pieces of Pulled Chicken Tikka Masala Wraps, Indian Chilli Paneer, Black Pepper Chicken Tikka Bites, Saag Aloo Skewers, delicately Spiced Lamb Samosas and Punjabi Chicken Lollipops. 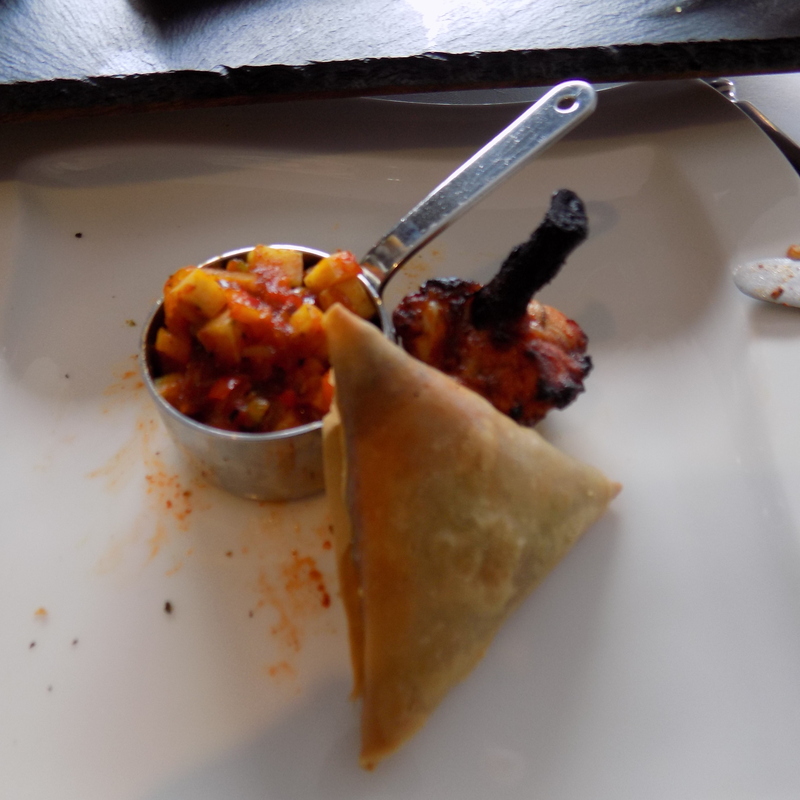 The Chilli Paneer was full of punchy spice but not in an offensive way, it was probably the spiciest thing on the menu. I particularly liked the chicken lollipops and wished there was a few more of those on the menu but then I am quite a greedy girl! The Saag Aloo was so moorish, I cannot fault anything on the savoury menu. 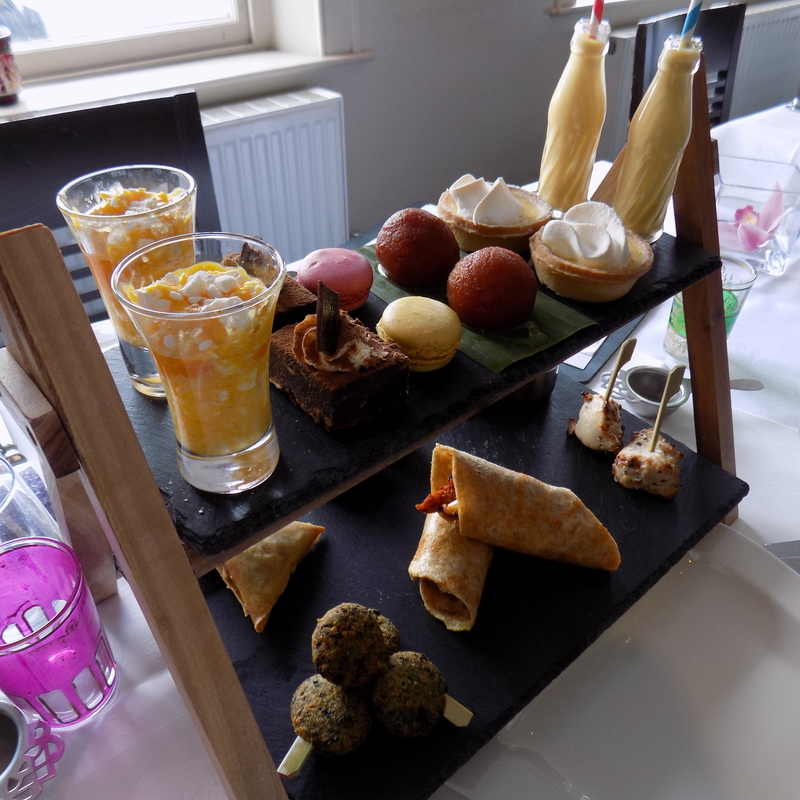 Suitably impressive was the sweet top slate, so refreshingly different from traditional Afternoon Tea cakes. What I found really clever about these sweets was the mango lassi in dinky milk bottles, all the rage right now, this exotic fruity, creamy potion calmed down my spicy palate before I dived into a celebration of Indian treats. On offer, Gulab Jamun, a milky Indian sponge soaked in sugar syrup, perhaps too sweet for some but I do have a sweet tooth so I coped very well with this delightful morsel. I was most impressed with the Indian inspired Eton Mess which was called Bombay Mess full of the customary crushed meringue and cream but the addition of mango and pistachios elevated and somehow qualified it’s new found ststus as an Indian Eton Mess. 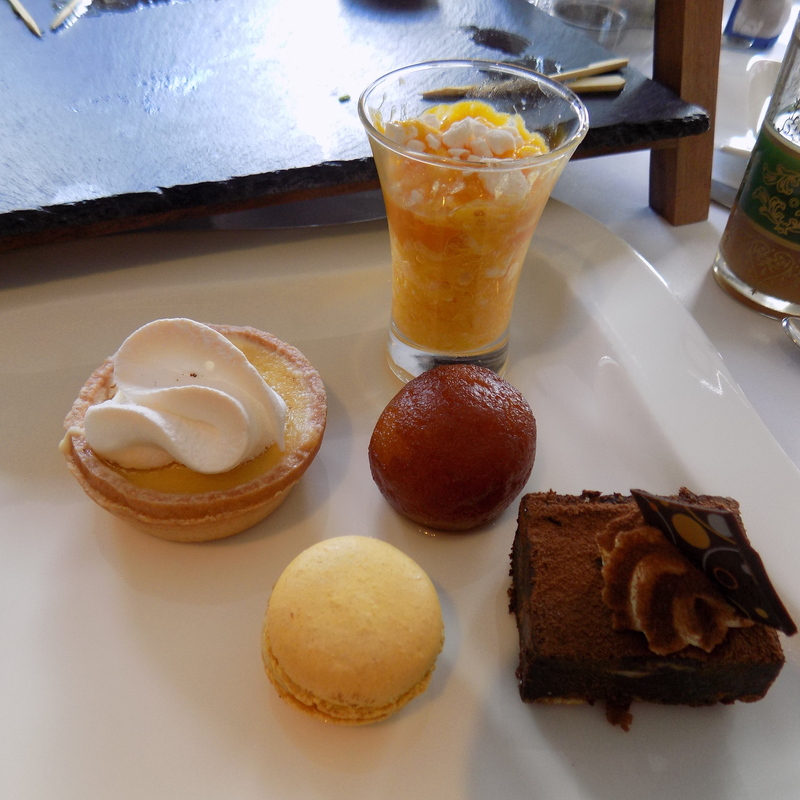 There were a couple of European cakes on offer in the form of the Passion Fruit tart similar to Lemon Tart, Chocolate Brownie and French Macarons. 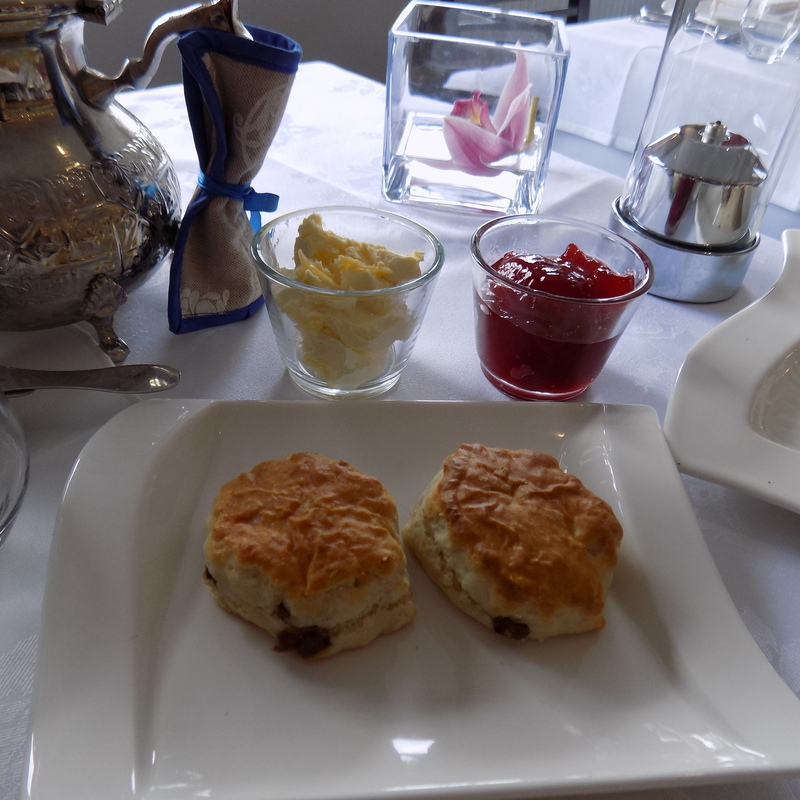 I was rather surprised to find scones, jam and cream on display, I found these a bit unnecessary if I am honest but still a very pleasant eat, I do wish there were more traditional Indian sweets on offer. 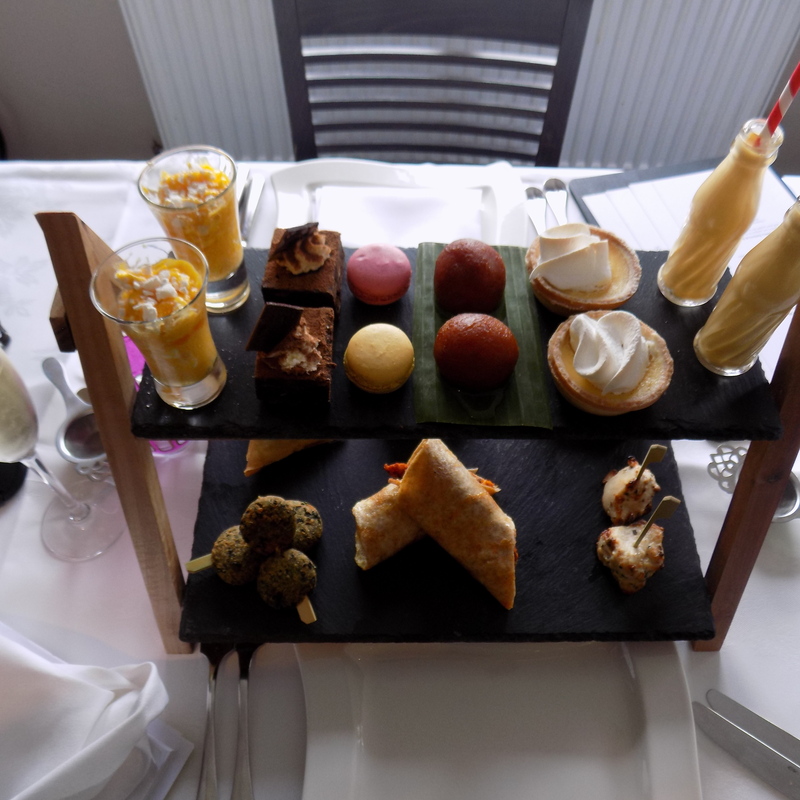 By the end, I was quite full to the point of bursting, “Jasmin” did herself proud in producing a twist on Afternoon Tea and it really works. 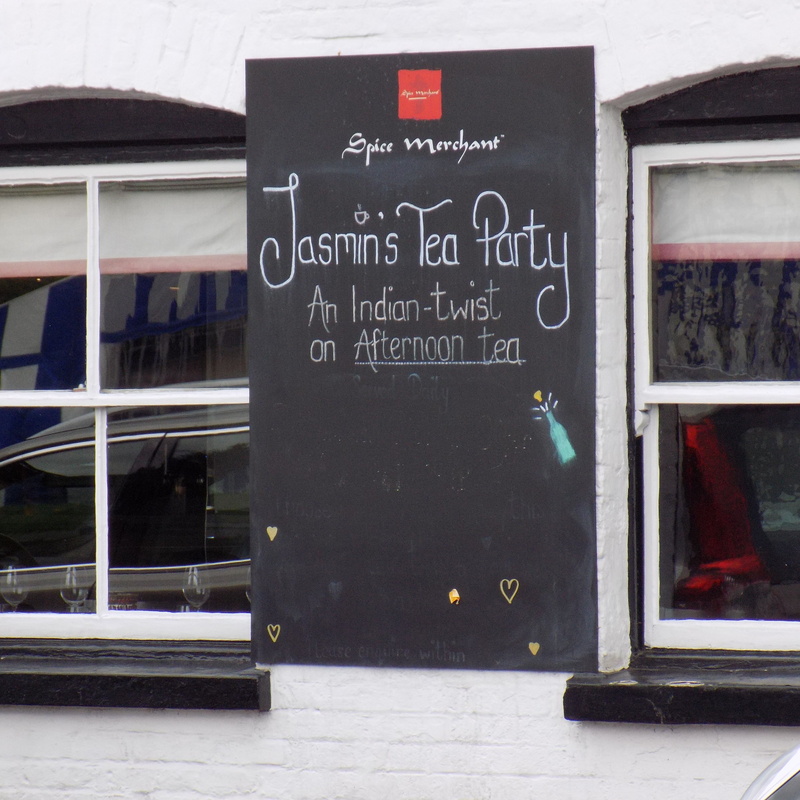 The Spicemerchant have come up with a genius idea in Jasmin’s Tea Party which can only go from strength to strength so if you happen to be in Henley, this most beautiful, idyllic and charming part of South Oxfordshire, do pay them a visit, you’ll be just as impressed as I was.